Most people have mobile phones to answer phone calls. And while I see the need for that too, I find it fills the need to have a convenient camera to take pics of interesting things you see. Having a phone in your pocket all the time to take interesting picture is good, but sometimes camera phones leave a bit to be desired. A bit grainy, sometimes blurry or not exposed quite right. Like my phone below. Nice composition, but the picture seems a little washed. Anybody have good advice on what mobile phone have good cameras? 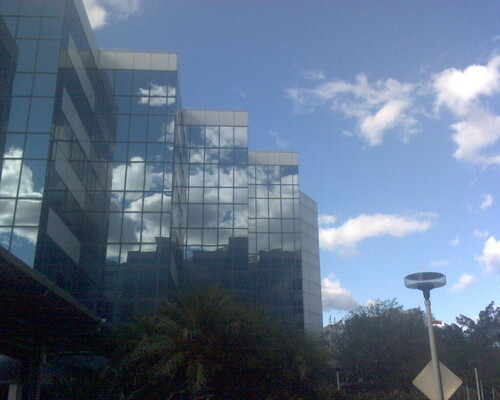 This entry was posted in Photos, Tech and tagged building, clouds, mobile phone, photo. Bookmark the permalink.